Put Your Questions to George Takei! UPDATE: Interview is now done. Hopefully will be up on the site in the next day or so! Geektown will be talking to the legendary George Takei next week as part of the promotion for the recently released Alternate Realities Fan Collective DVD box set. So, i thought it’d be good to give the Geektown visitors a chance to ask suggest some questions they’d like to put to a Star Trek legend! If you have any suggestions, leave them in the comments, contact us via the site, or direct message us on Twitter. The Star Trek phenomenon is boldly going where no man has gone before – to Alternate Realities – as Paramount Home Entertainment presents a collection of the best alternate reality themed episodes available on DVD on April 6 2009. No Star Trek fan should be without this incredible collection containing episode upon episode of fast-paced space adventure and brand new audio commentaries all presented in a beautifully packaged box set. 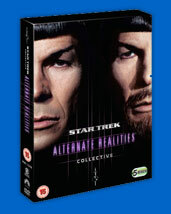 Voted for by visitors to www.startrek.com, this collection includes the top 20 most popular alternate reality themed episodes, including those from The Next Generation, The Original Series, Voyager and Enterprise. The STAR TREK: ALTERNATE REALITIES FAN COLLECTIVE follows the previously released and highly successful Borg, Q, Time Travel and Klingon Fan Collectives. Boasting 5 discs and 20 episodes, this is a must have for all Trek fans.